This dressed-up recipe for Nachos with Guac, Queso and Pico de Gallo is a delicious dish that’s quick to prepare and sure to satisfy guests’ game-day cravings. Nachos have reached ubiquity on appetizer menus and consumers are constantly searching for new flavors and preparation methods. 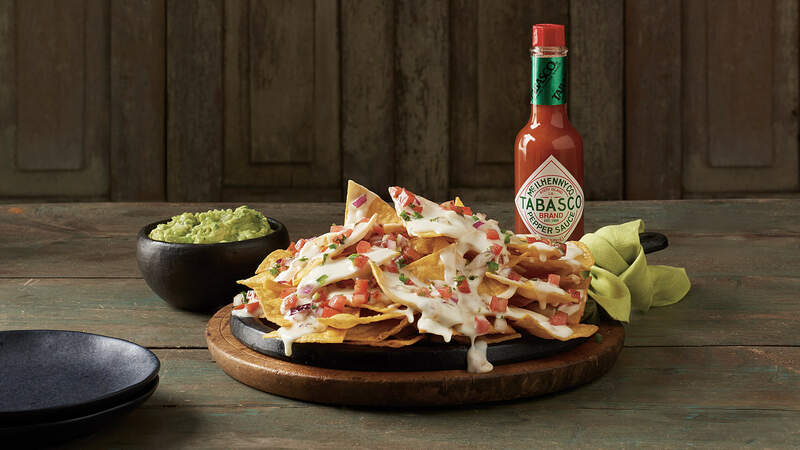 Mix TABASCO® Sauce into queso; pour queso sauce all over chips. Place into a 350ºF oven for 3 minutes to toast chips. Arrange guacamole around the base. Garnish with pico de gallo. Cost Per Serving* $2.42 Total Profit $--.-- *Based on FDA average pricing for ingredients.